Wednesday 28 October 2015. Nendö Island, village of Noipe. It was all the fun of the fair in the little village of Noipe. The kids were chasing each other around the green while the elders sat under a shady tree chewing betel nut surveying the scene with satisfaction. There were handicrafts laid out in a tent, pop corn, fresh green coconuts and traditional sago pudding with dried fish. After we had been ceremoniously unloaded from the backs of tipper trucks, the official events begin. 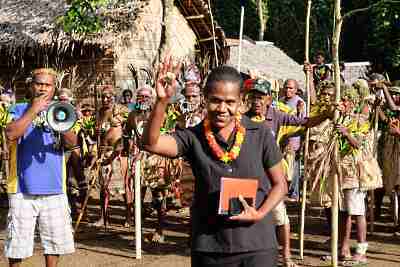 With introductions to senior islanders, including the much-loved local female minister, Joselyn Wesley Ipei, made with a raucous bullhorn the formalities kicked off with more traditional dancing and rituals. While parts of the Solomons use intricate shell constructions as currency, the people of Nendo create their tender with the tiny red feathers of the local Scarlet Honeyeater, cardinal myzomela. The long red strips, called tevau, comprise tens of thousands of these minute feathers are worn on the woman's head in a flat coil and can be valued up to A$20k. 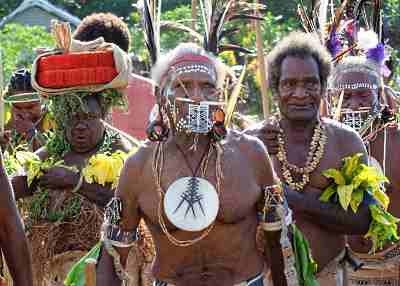 The celebration comprises men and women in costume chanting and stomping rhythmically in a circle. The men, in particular, with mother of pearl decorations through their noses and feather adornments are a striking vision. Dried nut shells tied in bunches to their feet add a musical percussion to the performance. Today the event celebrates an older couple returning to the circle after a period of mourning and the joy is too much for everyone to resist and soon the throng grows to almost fill the entire circular arena. At the day's conclusion we are sent on our way after a touching and clearly heartfelt farewell that included more songs, "hip, hip, hoorays" and shaking hands with every member of the village, young and old. It's a clear demonstration to us all how the power of responsible tourism builds bridges between cultures and reinforces the value of maintaining traditional practices in remote communities.